Thank you for your interest in Temple Bnai Israel. We are a small synagogue with just under one hundred member families. We are a diverse congregation who come from a wide range of backgrounds, observe in different manners and choose varied ways to be involved in Temple life. We have a wonderful full-time rabbi, Jeremy Schwartz, who has brought an amazing energy to this Temple since he and his family joined us in 2000. Besides introducing us to the Reconstructionist movement, he has shared with us his own individual enthusiasm and caring. The result is a community that takes care of each other and provides much more than just a place to go for services, although many of us truly enjoy the services and have even learned to lead them ourselves when Rav Jeremy is away. Because our numbers are few, we encourage all of our members to become involved in our congregation by joining committees. This is a great way to meet people and it is good for all of us. You will find that this is an extraordinarily welcoming community. 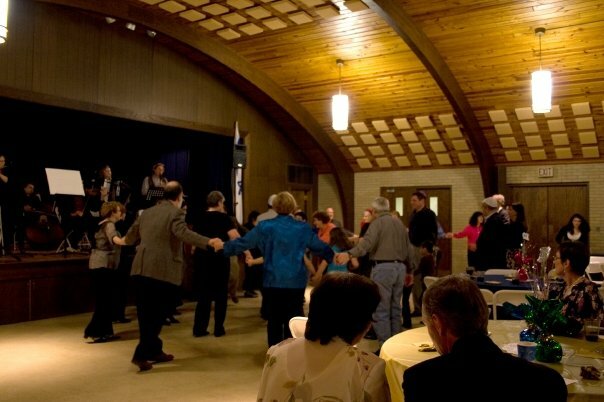 Being a Reconstructionist congregation, we celebrate and expand our tradition as we adapt to an ever-changing world. Our Shabbat services are interactive, with questions from the congregation encouraged throughout. Once a month we have a Bagel and Bible Saturday morning service which begins with a discussion group and is followed by a shortened service. Sometimes, especially in good weather, we have Friday night services at a member’s home. Otherwise, we have Shabbat services every Friday night and Saturday morning. For the High Holidays we offer alternative observances for the young people and adults who don’t want to sit through the entire service in the sanctuary. We also host a community Passover Seder each year and at Purim Rav Jeremy really gets into the spirit and things become very crazy and fun.Especially given our size, we have an active social calendar. We have a book study group, annual vegetarian chili cook-offs, concerts, pot-luck dinners, and an active adult education program. We look forward to meeting you at an upcoming service or other event. If you decide to pursue membership in the Temple, the next step would be to meet with Rav Jeremy. You may call the Temple office and schedule the meeting with his administrative assistant. Once you have met with the rabbi, you would then fill out a membership application which is submitted to the Temple Board of Directors for consideration and voting. Upon acceptance of your membership, we will ask you to pay your membership dues. Dues are calculated on a sliding scale depending on your declared income level. All of this will be explained in greater detail as you proceed with the membership process, but please feel free to call with any questions you may have at this time.